Charles Urban was an astute film entrepreneur. Under his stewardship, both Warwick Trading Company and Charles Urban Trading Company dominated the early British film industry. 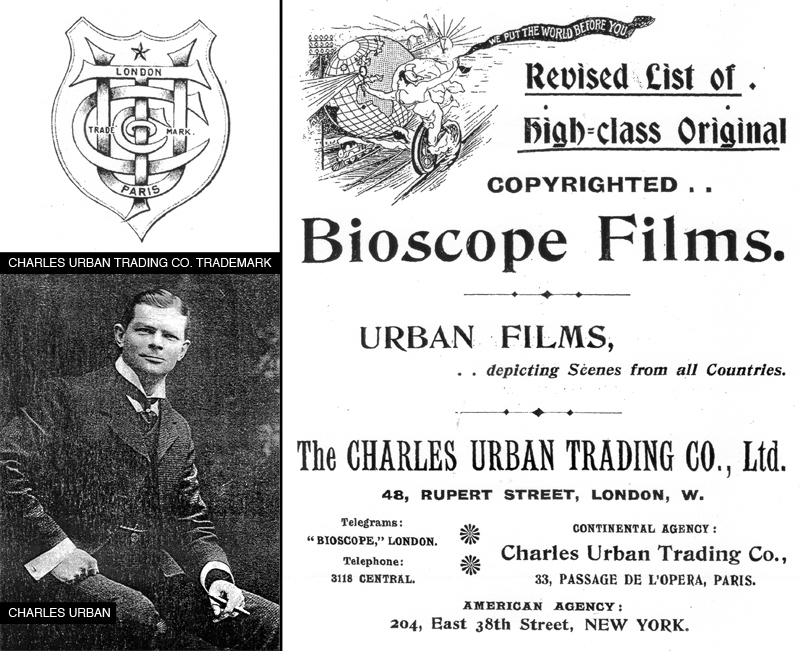 Besides producing travel “actualities”, Charles Urban also made educational-scientific films (eg. the ‘Unseen World’ series), animal and natural history studies, ethnographic records (North American Indians of the Ojibway Tribe), war documentaries (the Russo-Japanese War) and comedic films (‘Humorous Facial Expressions’). But travel subjects really made up the bulk of the company’s oeuvre, as Charles Urban had sent his cameramen all round the globe, so as to be able to “put the world before you” – the company tagline went. Perhaps because it was a British colony and an important port of call, Singapore was well within the sights of Charles Urban and his cameramen on the move. Their earliest travel films made in the East were shot in British colonies such as India and Burma (photographed by Dr. J. Gregory Mantle). Cameraman Harold Mease Lomas also undertook filming trips to British-ruled North Borneo, Ceylon (Sri Lanka), Singapore and Malaya, most notably directing The Cingalee (c.1903-4), the title of which was likely a dated, mispronunciation of ‘Sinhalese’, referring to the inhabitants of Ceylon. 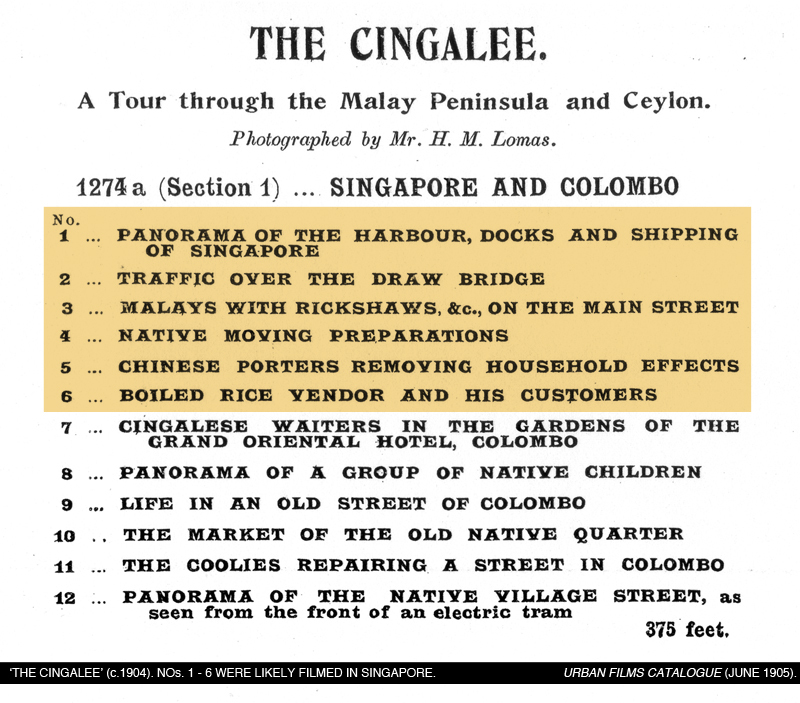 The Cingalee was subtitled ‘A Tour through the Malay Peninsula and Ceylon’, and its ‘Section 1’ contained scenes of ‘Singapore and Colombo’. 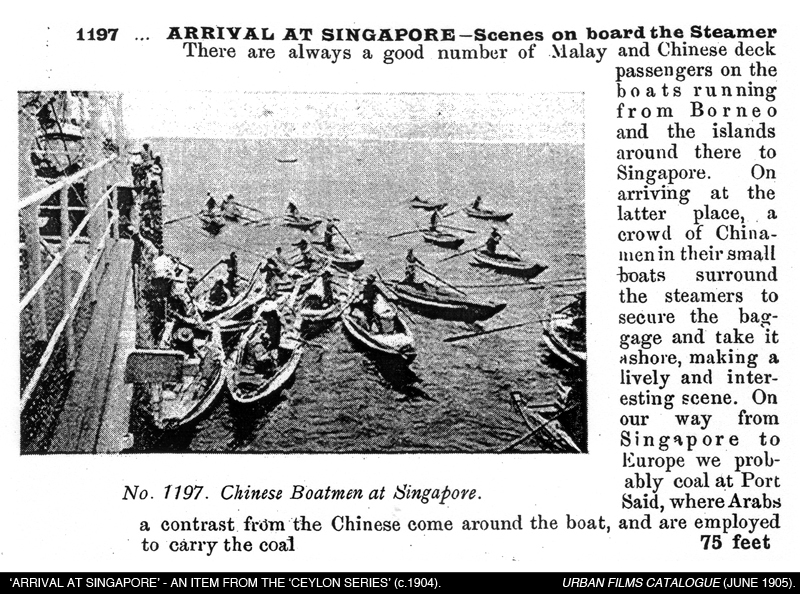 Singapore scenes in The Cingalee was in fact preceded by an earlier “actuality” film Arrival at Singapore (c.1903-4), which was an item from the ‘Ceylon Series’, as listed in the Urban Films Catalogue (June 1905). It was likely filmed in and around the harbour of Singapore. The crew (was it led by Harold Mease Lomas?) was probably only in transit at Singapore, arriving from North Borneo(? ), en-route to Ceylon and Europe. 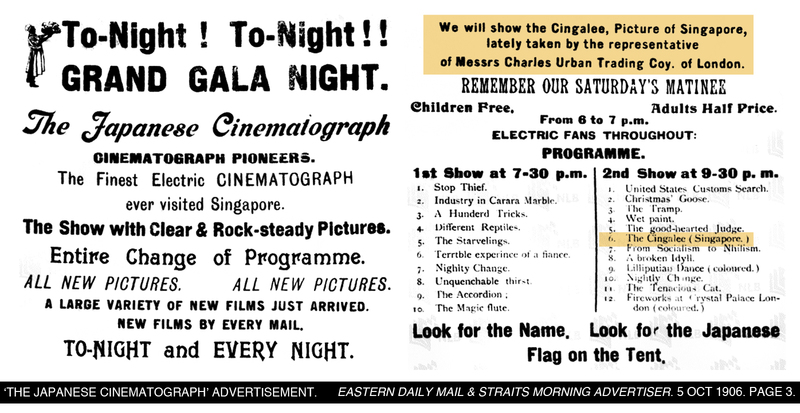 We also discovered that The Cingalee might possibly be one of the earliest films featuring scenes of Singapore to be shown to an audience in Singapore. In October 1906, Y. Kaneichi’s ‘Japanese Cinematograph’, a movie-screening tent at Beach Road near Raffles Hotel, had included The Cingalee in their nightly programme. 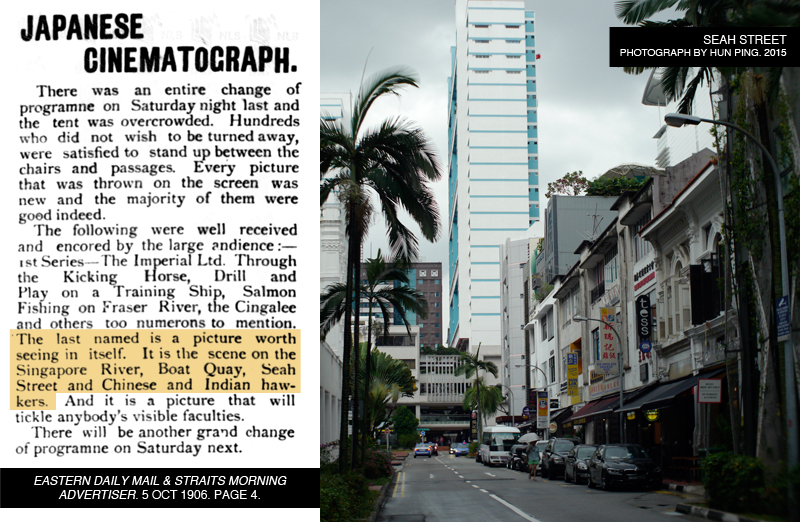 In advertisements posted in the Singapore press, they even publicised the film as a highlight of the show, with the expectation that local cinemagoers would likely be attracted to watch a film made in the same place where they were working and residing. That must have been quite a novelty then. 1. Stephen Herbert, A History of Early Film (Vol. 1). London: Routledge, 2000.